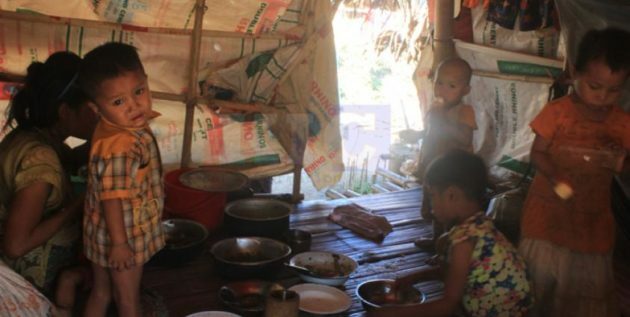 Over 5,000 internally displaced persons (IDPs) in Myaing Gyi Ngu in Hlaingbwe Township, Karen State have run out of food since July 6 and they are in immediate need of rice and other food supplies, officials from the IDP camp said. Saw Tun, an official in-charge of food supply at Myaing Gyi Ngu IDP camp, said the IDPs consume 21 rice bags per day and they are facing the food shortage due to lack of regular rice donors. “Rice runs out sometimes since there are many people here. When it runs out, they have to eat the food they have stored. We still have oil and soybean. We don’t need to worry about them. The main thing is rice. We have asked for it from the government. Now, we heard that some villagers and monks from a village will come and donate rice,” he said. A monk and local residents of Ya Thayt Pyan Village of Hpa-an Township donated over 100 rice bags on July 6 to meet the IDPs’ urgent need for rice supply. The Karen State government donated over 1,000 rice bags last March and officials from the IDP camp have urged the state government via Hlaingbwe Township General Administrator to address the current situation. Fighting between the joint team of the Tatmadaw and the Border Guard Forces (BGF) and the Democratic Karen Benevolent Army (DKBA) splinter group prompted thousands of people to take refuge in Myaing Gyi Ngu IDP camp in 2016. Over 5,000 people are still living at the IDP camp as they are afraid to return home.